I knew it was coming, but I've been in denial. As much as I thought I was ready for the winter break from gardening, now that it is upon us, I'm not so sure I want it just yet. The news has been using the dreaded "F" word today - FROST. As you may recall, in the winter, our house is home to some 175+ plants. As hard as I have tried to be ruthless in winnowing down that total, somehow it's not going so well. I find it hard to throw out any plant that has a single green anything on it. But some of these I've been trying to resurrect for a couple of years now, so I think it's time I give up the ghost, even if they aren't ready to do so. That means that today my tasks include getting the basement greenhouse cleaned up and ready for the deluge of plants that will reside there for the next six months, more or less. Tonight, the low is to be 34° and especially in the outlying areas (that would be us), that could mean frost. 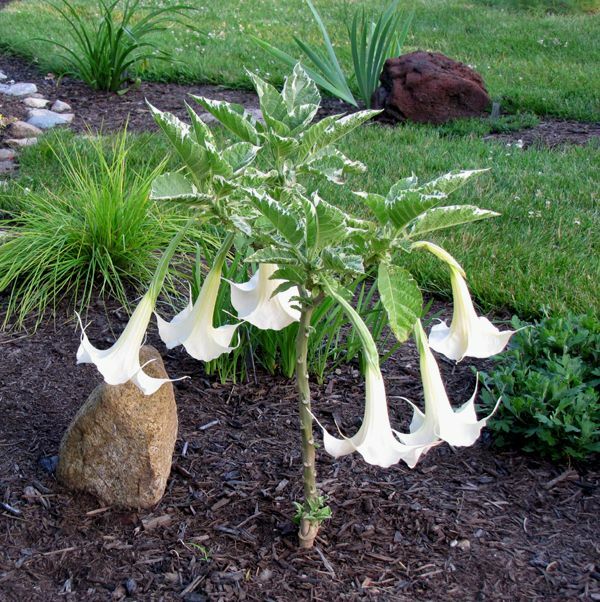 The brugmansias won't survive that, nor will the succulents, which have a high water content in their foliage. 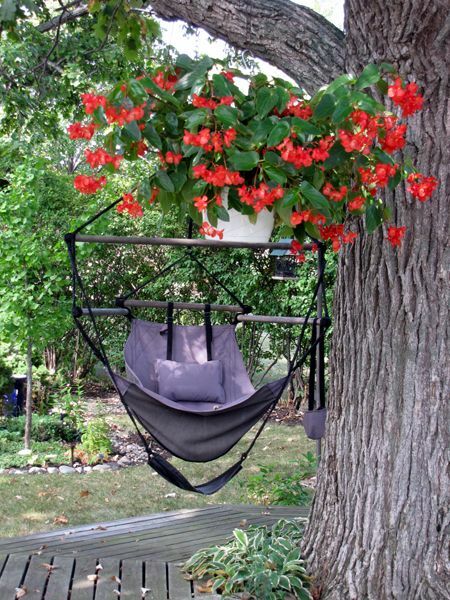 I'll also need to bring in the gloxinia, the streptocarpella, and that freakishly huge hanging begonia. The orchids can't stay out in the cold. 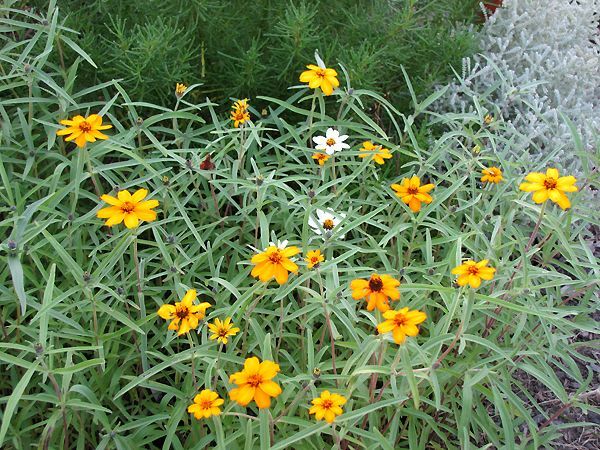 The Calla lilies need to be dug and if I'm going to try and overwinter the 'Limerock Dream' Coreopsis, I'll need to dig it up and at least bring it up under the cover of the porch, if not inside just yet. 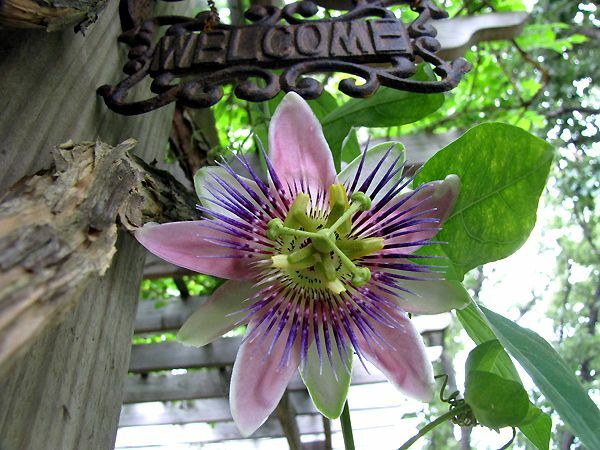 ...nor will the beautifully blooming passion flowers. And what on earth am I going to do with the three ginormous Boston ferns? They're so gorgeous, but there truly is no room for these 3-4 feet in diameter monstrosities. I may try to find room for one, but what shall I do with the others? Can I cut them back and put those in the basement, too? The pelargoniums will be fine. 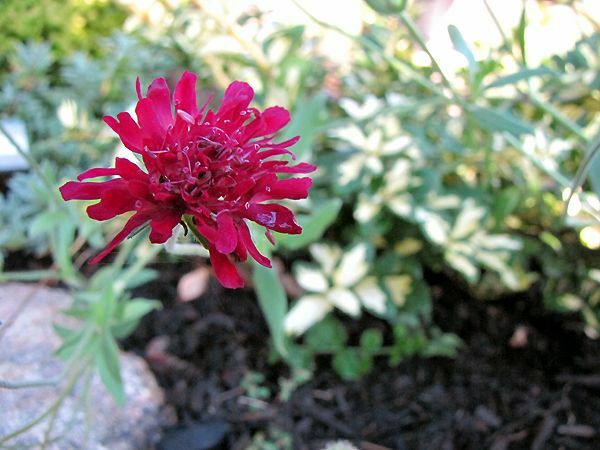 Several of the blooming perennials will be too, such as the asters and mums. This frost event is only to be one night and then we'll be back in the mid-40s for awhile. But it's just a matter of time before it will be an every night affair and the plants have to come in anyway. 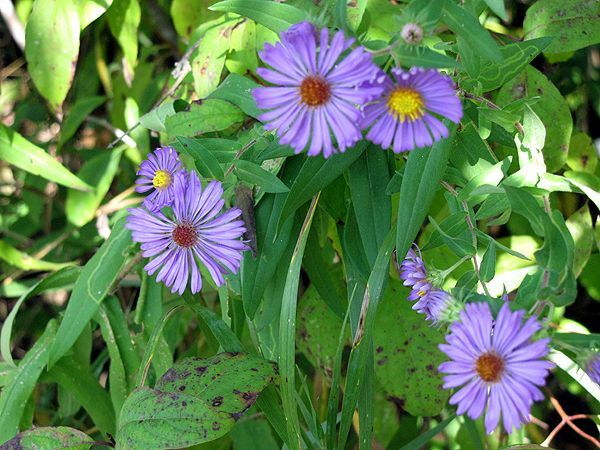 When the wild asters are in full bloom, the skies are bluer than blue, and the breezes bring that distinctive feel to the air, you know it's fall. The leaves have started to change, so much so that the woods dotted here and there are becoming a patchwork of yellows, reds, oranges, and shades of green. 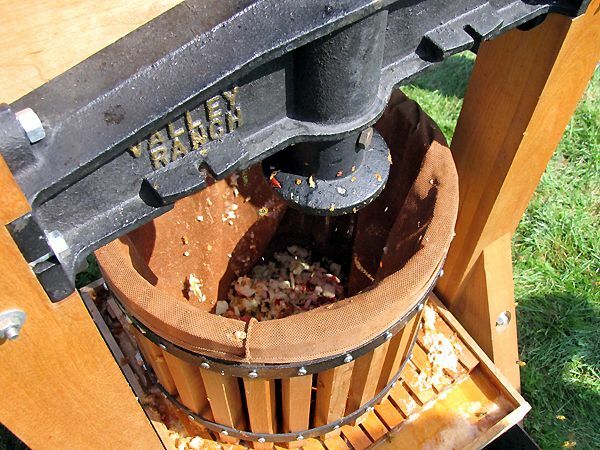 One of the popular fall activities around here is making apple cider. I can remember doing this as a class to sell at the homecoming football game when I was a senior in high school. 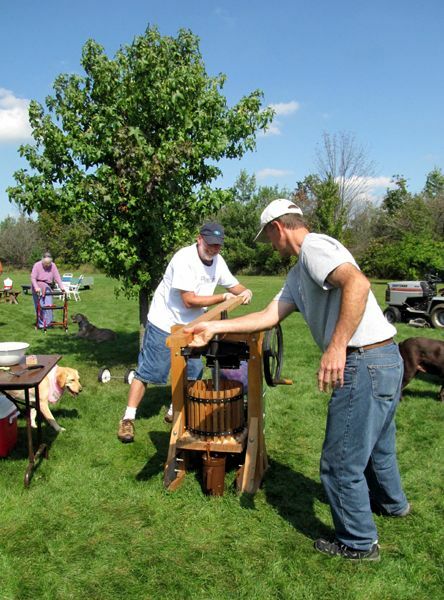 So when my friend and co-worker, Diana, invited us to her and Cal's place to pick apples and make cider, we enthusiastically made the short trip through Amish country to join the festivities. When we got there, things were already in full swing. There was a fire going so we could roast hot dogs and guests had brought plenty of food to go with them. There's a particular wildflower print I've seen, and I have to have it. I've googled the name[s] and I've searched botanical prints on Art.com. My searches have come up empty, but perhaps I'm just not looking in the right places or in quite the right way. Maybe you can help. 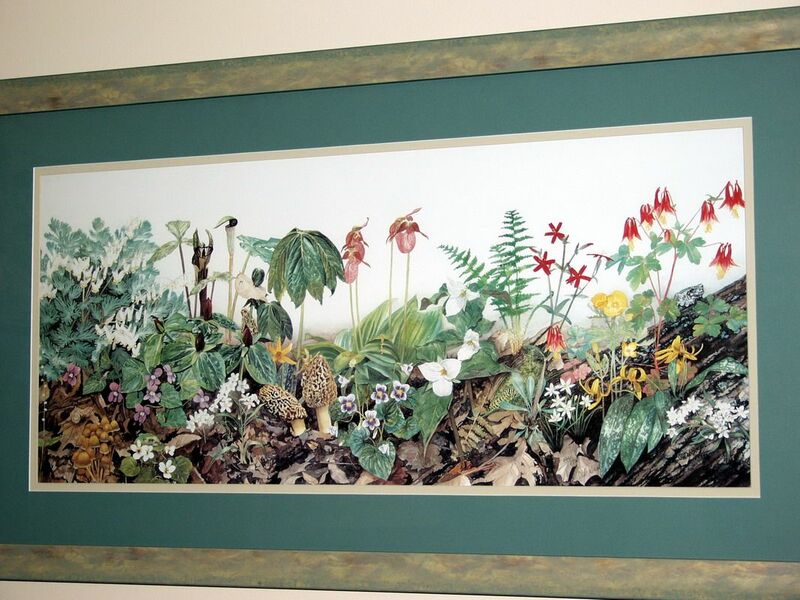 My friend Diana bought a botanical print for her husband's study several years ago. It measures approximately 40" by 20" and is signed twice by the artist. The first signature, "Deb Boyer," is on the original print and the second was added by the artist later and is "Deb Wright." I can only assume that the artist got married (or divorced) which might explain a name change. With the second signature, it indicates that there were 2500 prints. 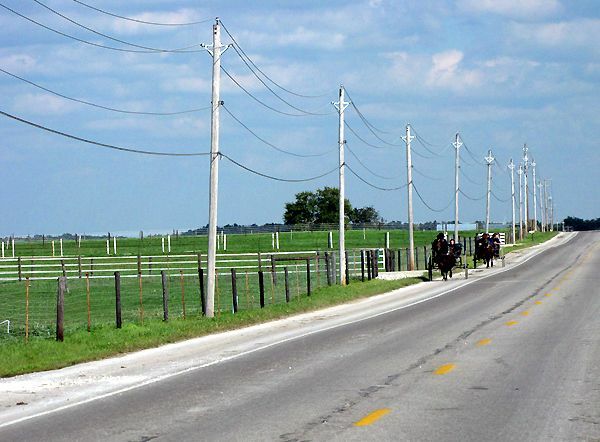 Diana purchased the print at an art shop in the Village at Winona near Warsaw, Indiana, but the art shop is no longer in business, so that lead met a dead end. Perhaps you've heard of the artist or have seen this print. I'm hoping the great network of gardeners can help me find one of the prints, because I really want one. 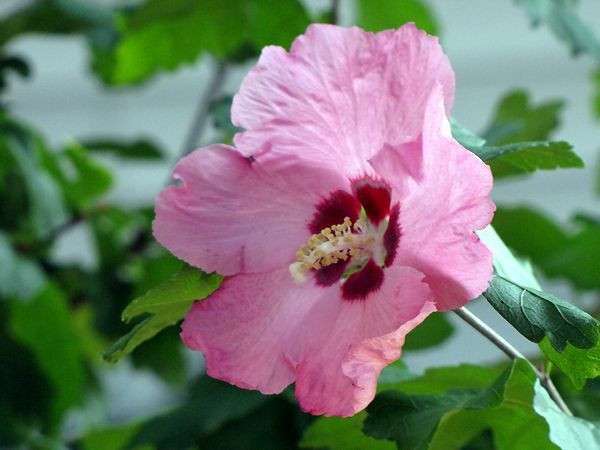 When our gardens were in the Van Wert County Master Gardeners Garden Walk in August, there were three plants that caught the attention of several visitors. If you would have asked me prior to the garden walk which plants would be the subject of so many comments and questions, I wouldn't have chosen any of these! One of our weeping willow trees died in the middle of last summer, but we left the bare tree and pruned the branches. We didn't know what we were going to do with it, but I knew I didn't want to cut it down until I'd thought about things a little bit. 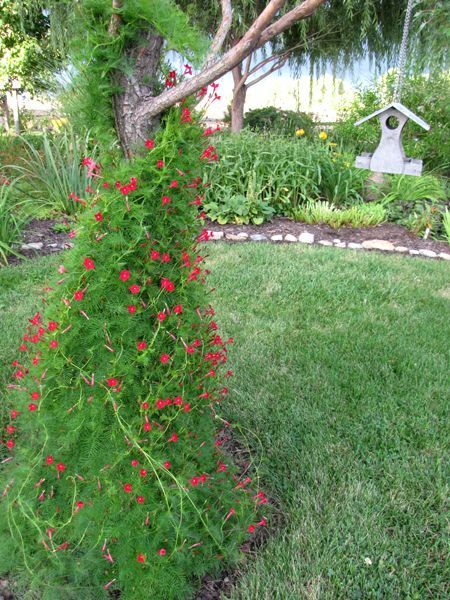 About the middle of June, I decided to plant some Cypress Vine seeds in the hopes that the vines would twine up the tree and out onto the branches. That's what they did, but it took them until the first of September to make it to the branches. 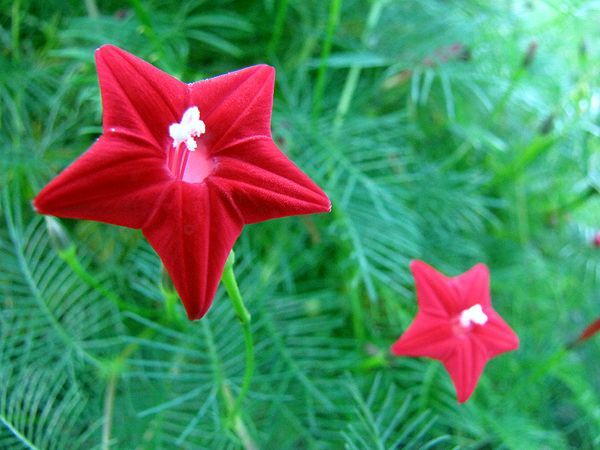 Even so, with the trunk entirely covered with its airy, ferny foliage and tiny red and pink blooms, people wanted to know what it was. Next year, I'll be sure to get the seeds planted early. It's an annual, but it's a prolific self-seeder, so I may not need to plant seeds at all. I'm still pulling out seedlings from the place where I grew it three years ago. This climbs up our light pole in front of our house, so it was one of the first things people saw when they arrived. 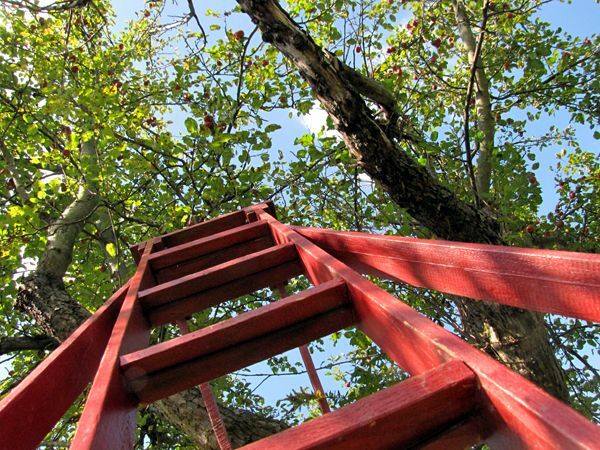 Technically, it doesn't climb like most clematises. It's a bush-type, but I have transparent fishing line strung so it grows up through that, which keeps it somewhat in control around the pole. It's a fast grower and I've had to cut it back twice this summer. 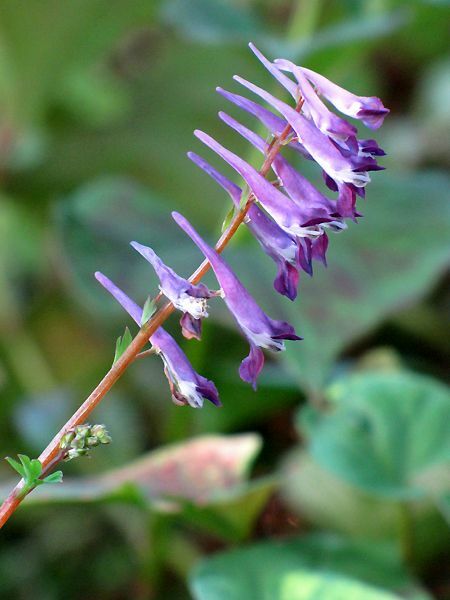 It has tiny lavender blue blooms that look like little bells. By far, the plant garnering the most attention and comments was an annual that I grow every year. 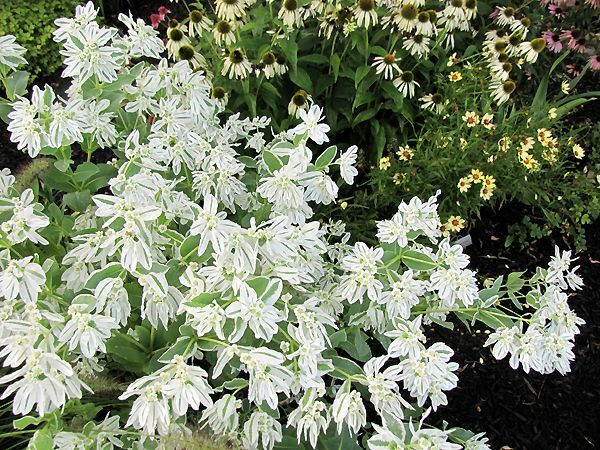 Snow-on-the-Mountain is easy to grow from seed and is another prolific self-seeder. 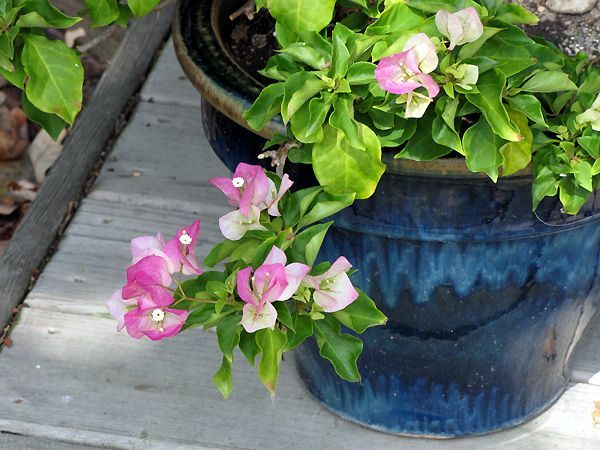 Growing to a height of 2-3 feet, it starts out with almond-shaped leaves of solid light green. 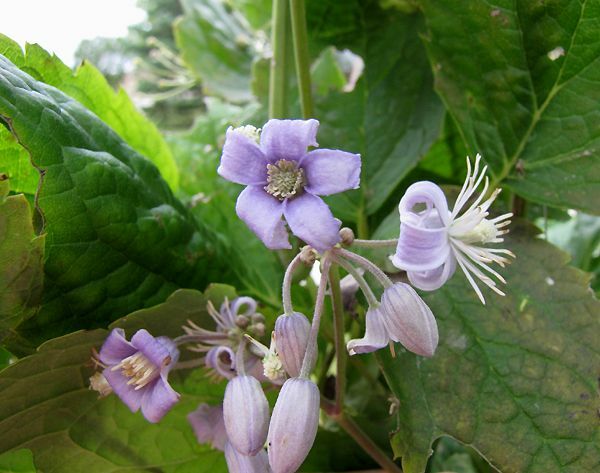 As the plant nears its maximum height, the upper leaves begin to turn white on the edges and tiny flowers open at the very top. 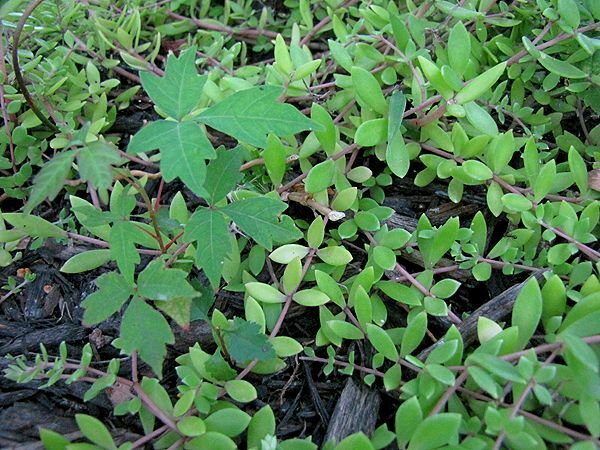 Like all Euphorbias, this plant exudes a milky sap containing latex, which causes skin irritation in some people. When I first started growing it, I only handled the plant with gloves on, but in subsequent years, I have gotten careless about it. 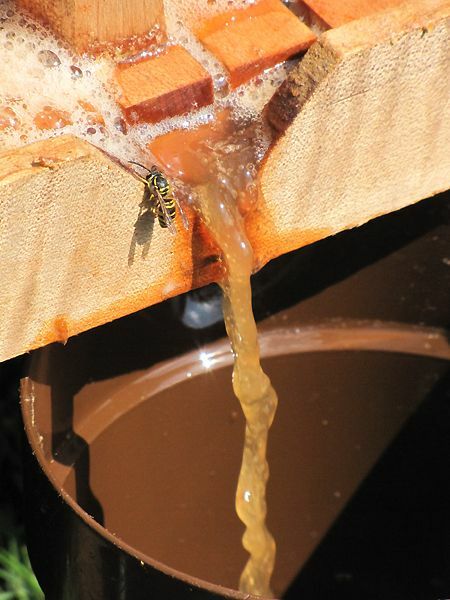 Personally, I don't experience any reaction to the sap, but those with latex allergies should avoid handling this plant. The seed pods are interesting. They have three rounded sections and when completely dry, they explode, propelling the seeds several feet away. I call them Explod-O-Pop seeds. When I bring them in the house to finish drying, I have to cover the dish because the seeds end up all over the kitchen if I don't. You can actually hear them "exploding." SNAP! 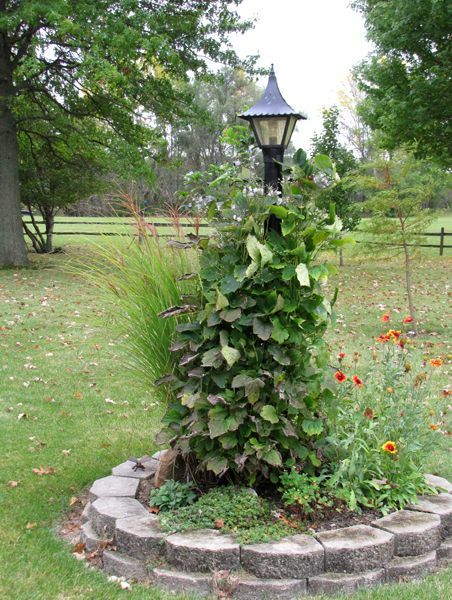 Which plants are conversation starters in your garden? 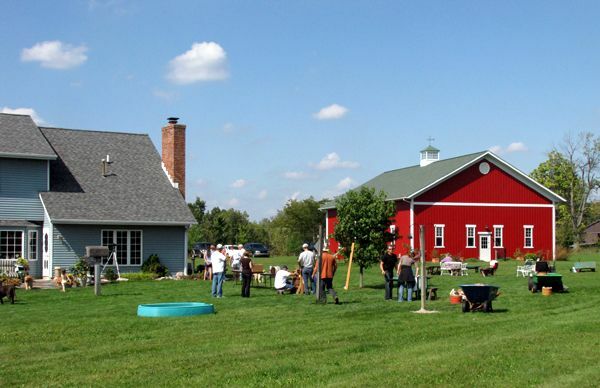 The 2009 Blotanical Awards are now open for voting and I am honored that Our Little Acre has been nominated for Best Ohio Blog! 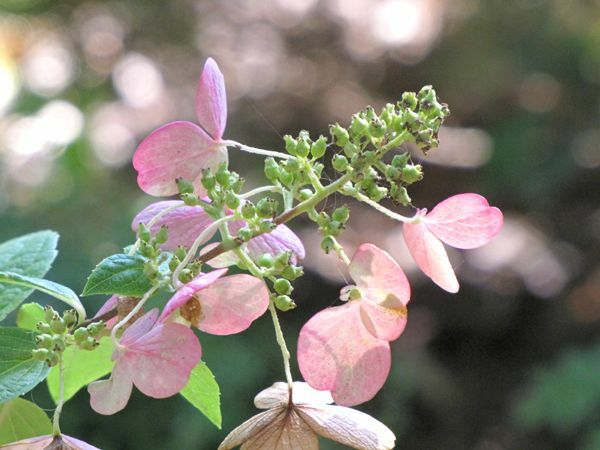 Blotanical is a website that brings together over 1500 garden blogs from around the world. I have discovered so many wonderful writers, photographers and overall great gardeners through Blotanical, and they have taught me a great deal over the last couple of years. You don't have to be the writer of a garden blog to be a member of Blotanical. If you haven't registered on the site, I urge you to do so and take advantage of this wonderful portal of gardening knowledge. It's garden networking at its very best! Voting for the awards will end on Tuesday at midnight (EDT), so if you are a member of Blotanical, be sure and visit the voting page and cast your vote for your favorite garden blogs. 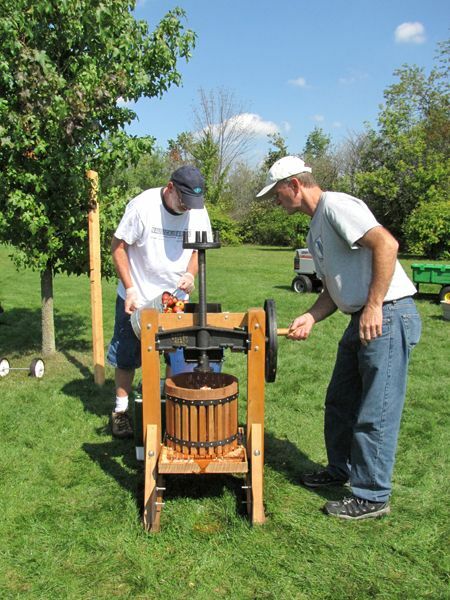 If Our Little Acre happens to be the recipient of your vote for Best Ohio blog, I thank you. To all who are faithful or occasional readers here, I appreciate that you take the time out of your day to read about what's happening in this little corner of our world. Vote for Our Little Acre here. 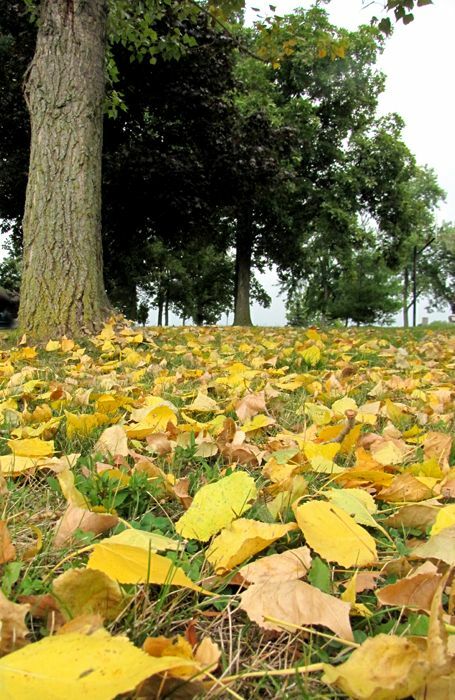 We are in the transition from summer to winter, otherwise known as autumn. The weather is fickle from one week to the next, sometimes one day to the next. My favorite fall days are during what I call "sweatshirt weather," when a pair of jeans and a sweatshirt are all that are needed to keep the chill off. Sweatshirts aren't needed just yet - not during the day - but once in awhile they feel good in the evenings. Those evenings are perfect for weiner roasts, where the hot dogs aren't the stars of the show; the stars in the sky are. As I was moving some plants around the garden today and doing some watering of those areas under the eaves that didn't get the benefit of the .6 of an inch of rain overnight, I noticed some changes in the plants. They too are in transition, with colors of green giving way to yellows, oranges and reds, before they will turn brown and go dormant in their effort to survive another winter. They have one foot in the door of autumn, and the other still in summer. I call these "chameleon plants." 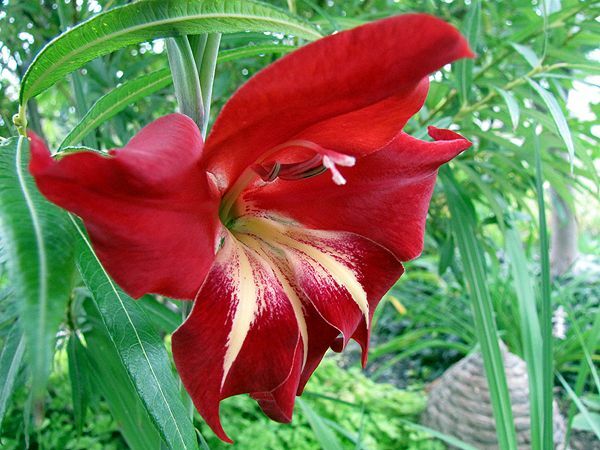 Oh yes, there is a plant that goes by that popular name, but I'm using the term for a group of plants with a changeable character. Some start out in spring with colors that belie their eventual summer hues. 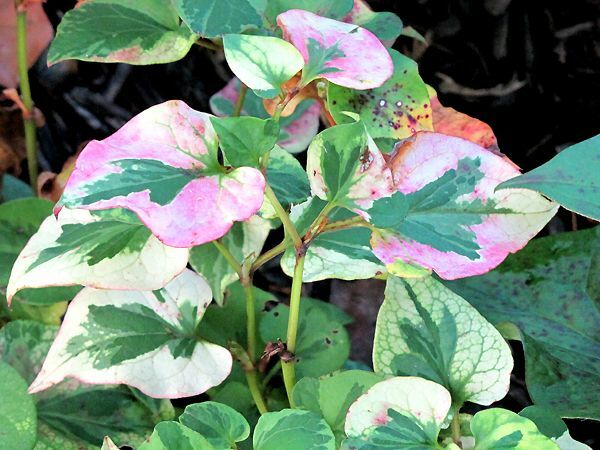 A good case in point are the emerging shoots of Fallopia japonica 'Variegata,' whose deep rosy pink stems rise from the ground in the spring, and eventually lead to beautiful green and white speckled foliage. 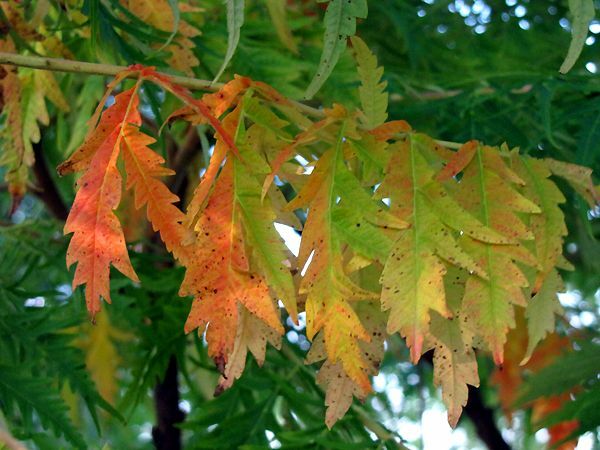 In fall, some plants change from green to the colors we usually associate with the leaves on trees. This is one of the shrubs that is original to the house when we moved here. It will eventually lose its leaves, but keep its beautiful red berries that look lovely in winter against the snow. The birds like them, too. 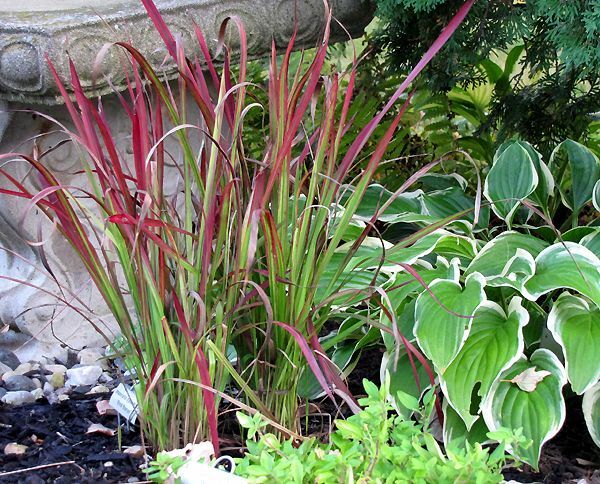 This is a perfect name for this astilbe, as the leaves are multicolored through the entire growing season. 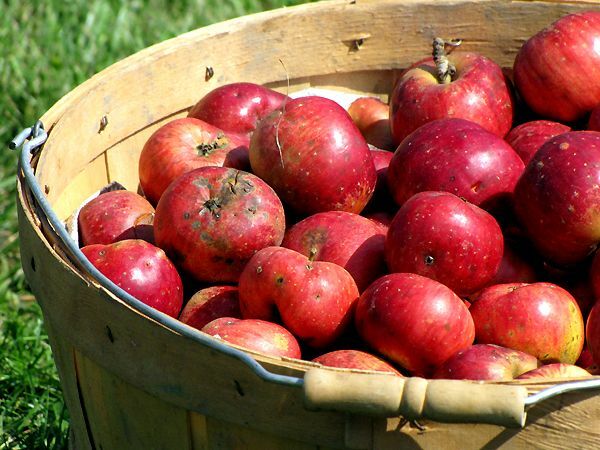 In fall, they're more pronounced. 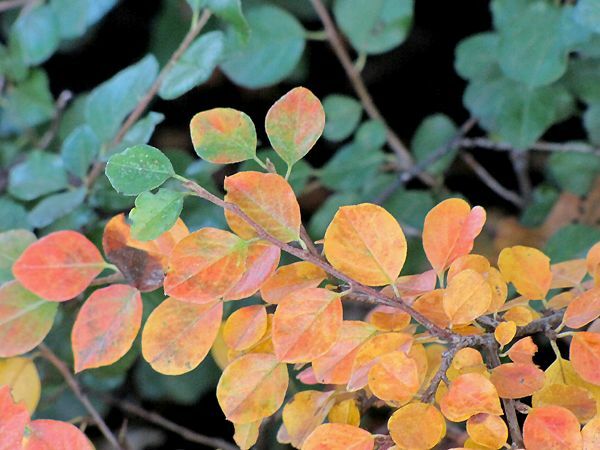 All of the above, and more, are in the beginning stages of the striking flush of fall color. 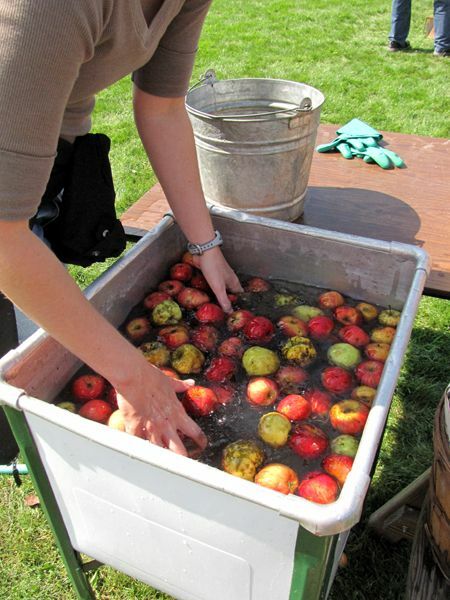 Very soon, the gardens and we will be firmly entrenched in autumn, with all the traditions that go with it - fall festivals, apple cider making, weiner roasts, Jack-O-Lanterns, and Thanksgiving. I can smell it already. Each year I try to grow at least one new thing in my potager garden and if it leans to the side of the unusual, all the better. 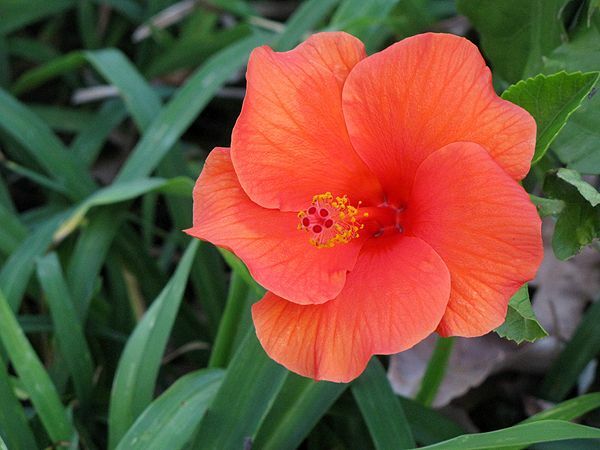 Since I'm a relatively new gardener (2005), there are many things that are new to me. 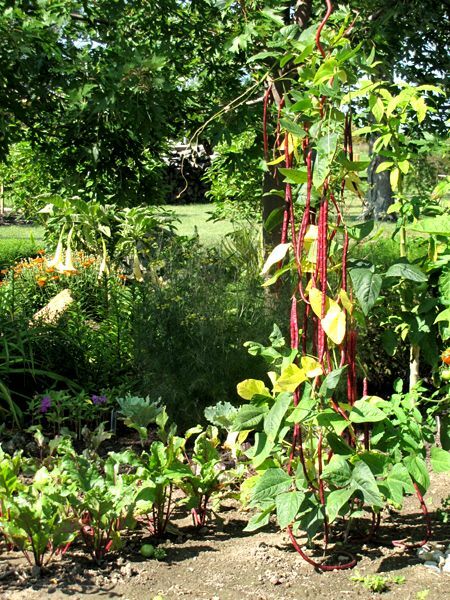 In past years, I've planted burgundy okra, French Charentais melons, purple beans, and hard neck garlic, to name a few. 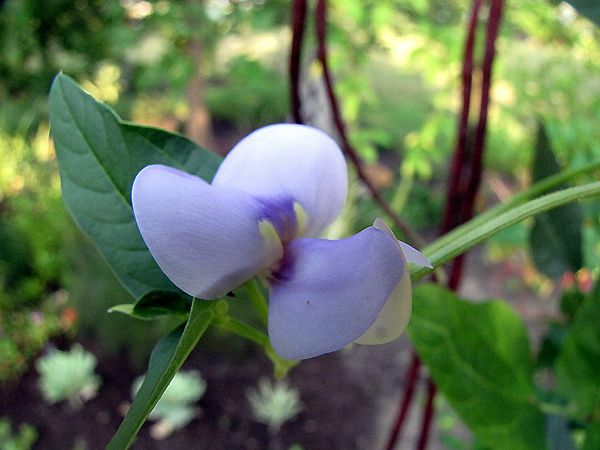 My New Thing for this year was Yard-Long Beans (Vigna unguiculata subsp. sesquipedalis). Though the beans are edible, I grew them for their uniqueness with no intention of eating them. If you were to eat them, they are prepared just like regular bush or pole green beans. The blossoms are large and quite pretty. None of mine reached 36" in length, but they came pretty darn close. 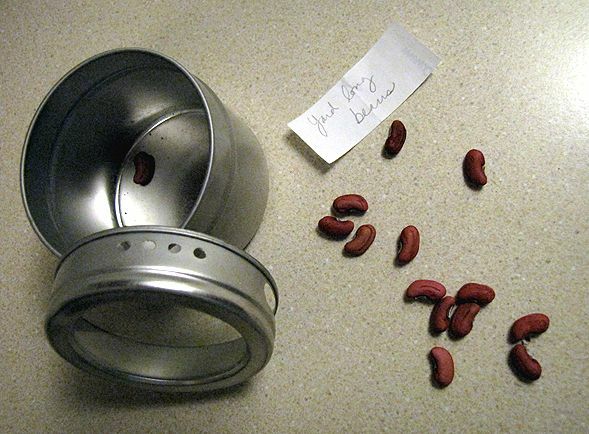 I'm saving the seeds from this year's beans so I can grow them again next year. I may even decide to eat them. Besides the unusual weather of the summer, this year also brought an unwelcome visitor to the gardens. The property where Our Little Acre is located was once a woods. It was mostly cleared about 35 years ago, to make the property more structure friendly. Our house was the first built (in 1975), with two others in the years that followed. Poison ivy (Toxicodendron radicans) is commonly found growing in the woods here, as well as along roadsides and in ditches. So finding it on our property shouldn't really be a surprise, except that prior to this summer, we'd only encountered it a couple of times in the 32 years we've lived here. Poison ivy growing among the sedum. 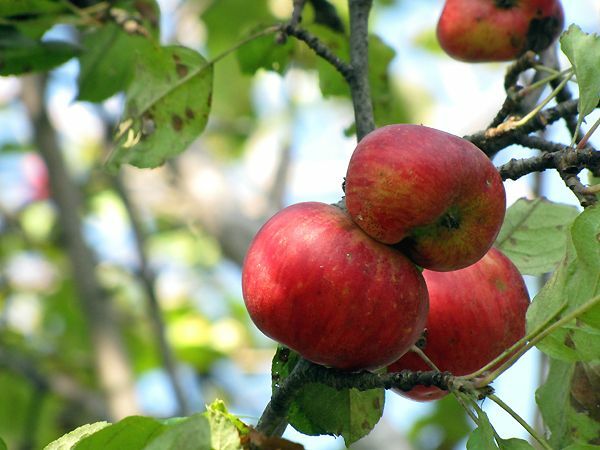 This year, we have found it at the base of trees and growing in the garden in at least ten different locations. Twice I found it growing right up through perennials that were just planted last year, such as Veronica 'Royal Candles.' How did it get there? In almost all cases, the plant was small enough to pull out, but one had gotten a pretty good start, so Romie carefully put Roundup® on its leaves. I put on disposable latex gloves to pull out the smaller ones, then pulled the gloves off over the plants and tied off the wrists for disposal in the trash. It had been at least a month since I'd found the last little plant, but tonight I found another one in Max's Garden. Since they are popping up randomly, this reinforces why it's a good idea to wear gloves while gardening! Has anyone else had a problem with poison ivy this year? If so, has it been a new thug you've had to deal with or is it an ongoing nuisance for you? I'm puzzled as to why all of a sudden we've got poison ivy scattered around when we've lived here for so many years without it? Just when I was ready to chop everything down due to the dry weather we've had all summer, we got a few days of rain. It's amazing what life-giving stuff that is! The garden responded quickly and fabulously and we're enjoying the blooms that are still going strong in our September garden. Other than one mum that's been blooming for a couple of weeks, we don't have any of those blooming just yet, although it's clear that they will be starting in a few days. But the asters are in full color, as I highlighted a few days ago. 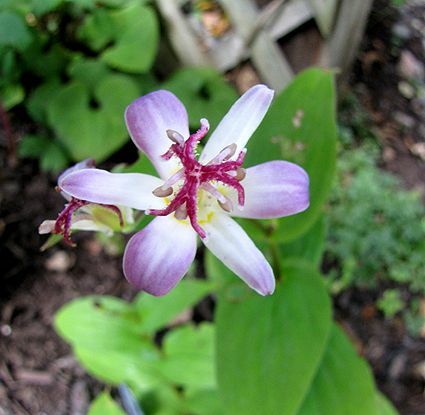 This is one of four toad lilies I have, and it is always the first to bloom. The other three are forming flower buds now, but it will be a week or so until they bloom. 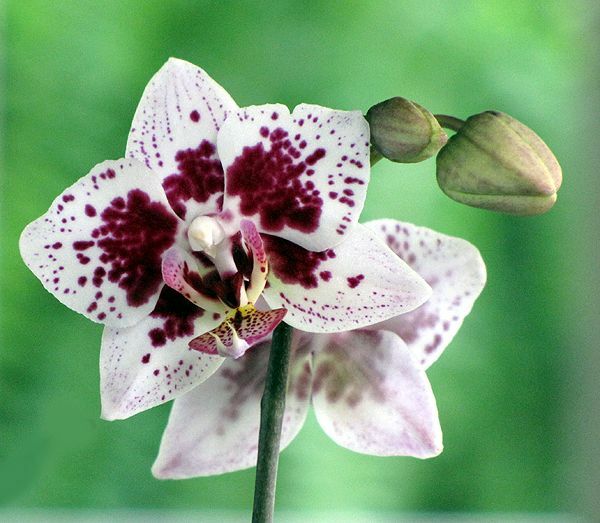 'Tojen' differs from most toad lilies in that it doesn't have the usual freckling on its petals. 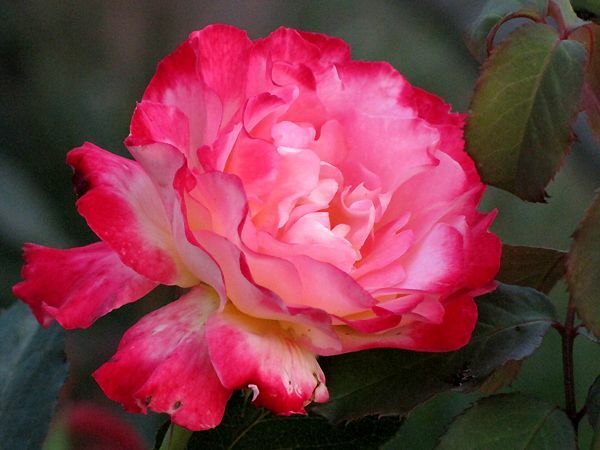 There are several roses putting out amazing blooms right now. 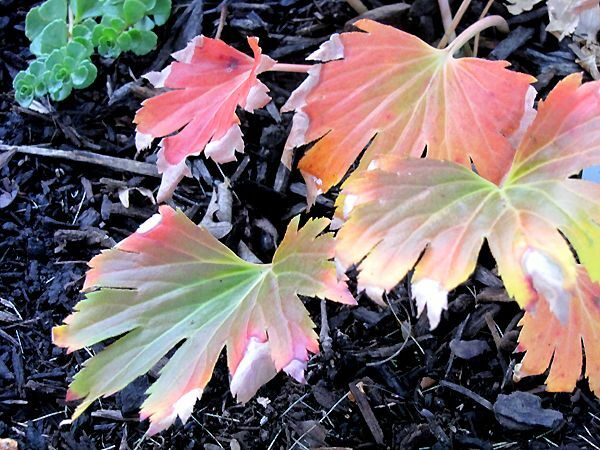 I love 'Kordes Perfecta' because of the color changes it goes through before it's spent. It starts out solid cherry red in color, with increasing white until finally there's only color at the very edges. It was hybridized by the famous Wilhelm Kordes, as were 'Dortmund' and 'Iceberg.' 'Kordes Perfecta' was created in 1957, just like I was! The sunflowers are waning, and the birds have pretty much cleaned out the seed heads, but there are still some straggler blooms that appear on occasion. 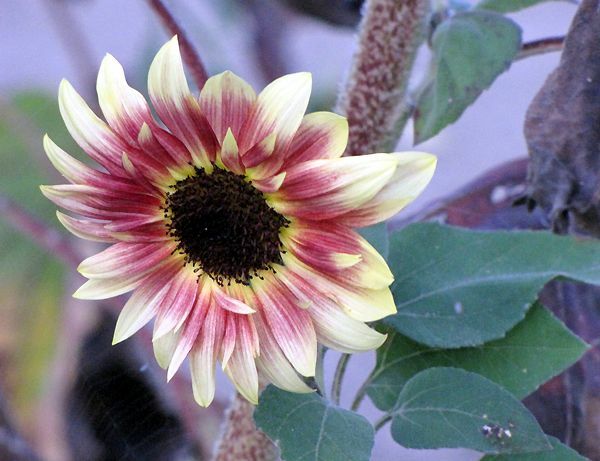 I always try to grow the branching type sunflowers (I look for 'branching' on the seed packet) because the foliage tends to stay nicer on them for a longer period of time and of course, you get multiple blooms. Mom gave me this seed last year and it had been collected a few years before that so I wasn't sure how well it would do. No problem! Some are single, some are double, and one looked like it was tie-dyed. 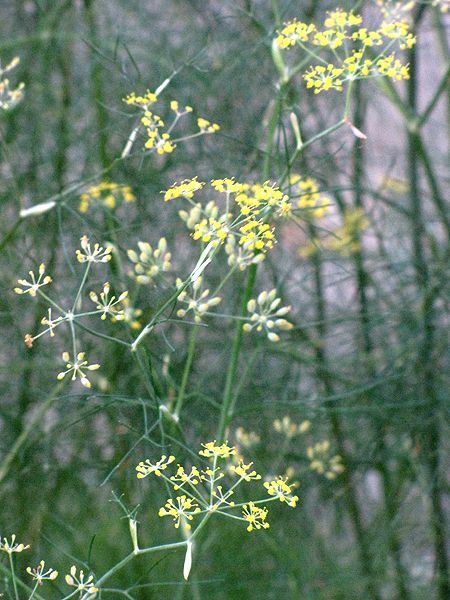 I've been collecting fresh seed from these and will plant them again next year. My 'Aphrodite' is grown as a standard. 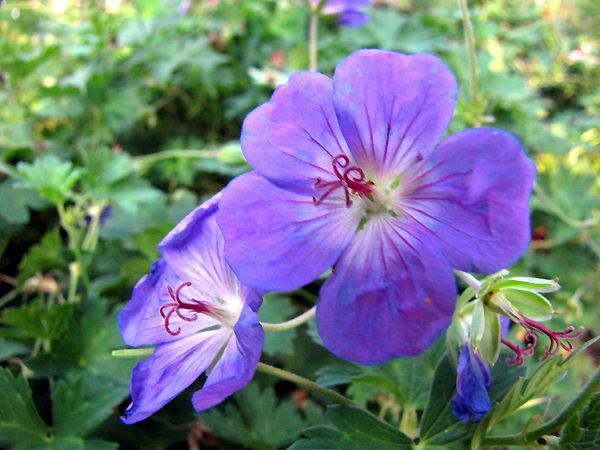 I've also got 'White Chiffon' and 'Blue Satin' growing in the regular shrub form. I've got these, some yellow and pink ones, and 'Atom' (my favorite). Though they are supposed to be hardy here, I dig them in the fall and replant in the spring. I left them in the ground one winter and only half of them made it through. 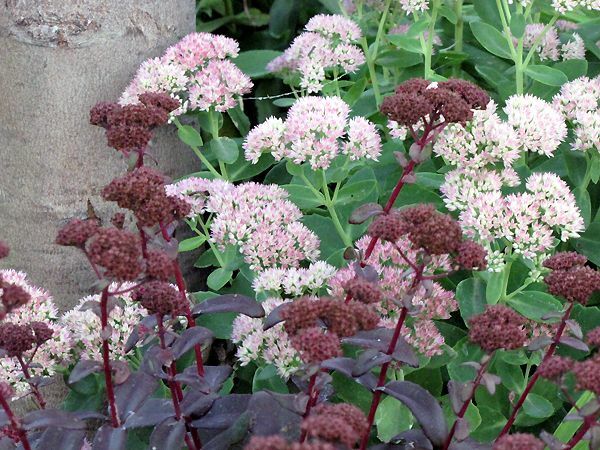 Though the flower heads are yellow, the foliage is green towards the bottom and burgundy towards the top. Zinnia angustifolia I love the glaucous foliage on this zinnia. 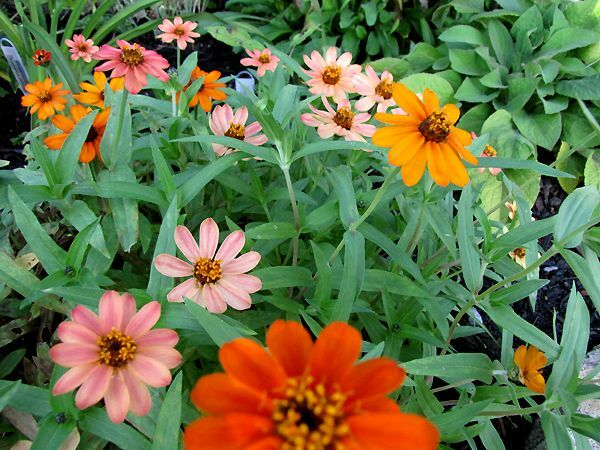 Like all my other annuals, this summer was not optimum for growing annuals, due to lack of rain and hot temperatures. So these were later to bloom than usual. 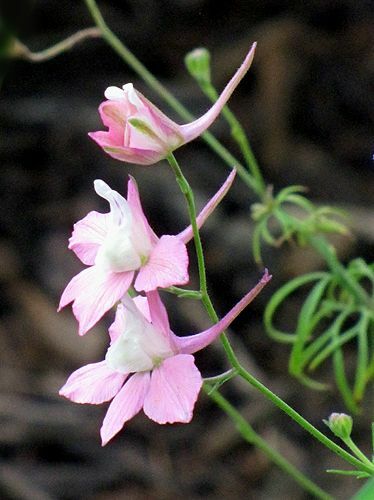 I saved seed from these last year and although hybrids aren't guaranteed to come true from seed, these did. 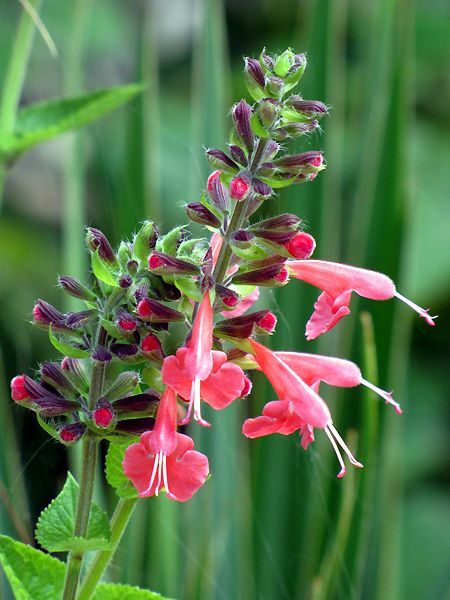 The hummingbirds and bees LOVE this salvia and so do I! It's a blooming machine and I love the color. This is one plant and I've not been faithful about deadheading it. 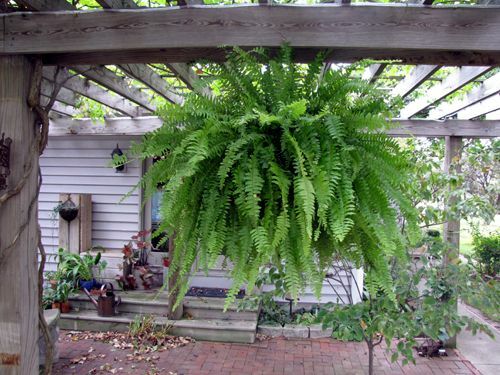 Wonderful plant for a hot, dry spot. 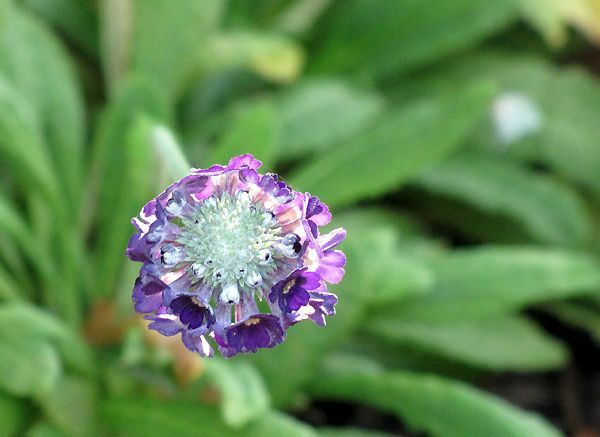 To see a photo I took of its bloom up close, click here. This reminds me of mini scabiosas. 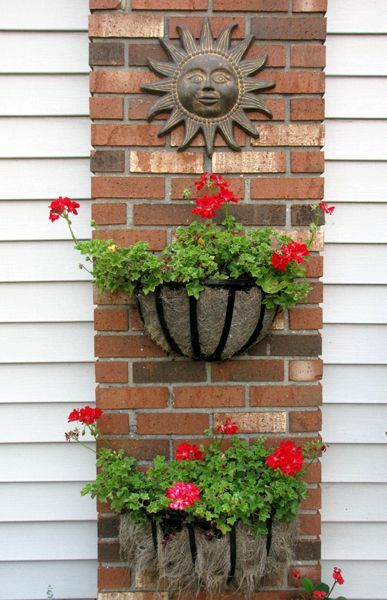 I've tried other plants in these wall baskets, but the ivy geraniums seem to do the best. 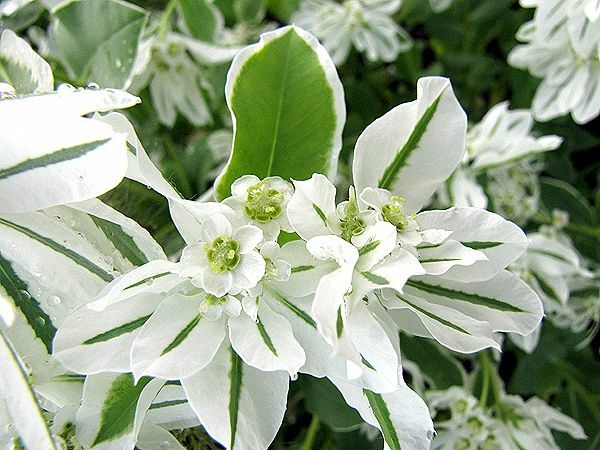 I've got a white paniculata blooming right now too (unknown cultivar). And of course, the Endless Summers® ('Bailmer' and 'Blushing Bride') just keep pumping out the blooms. They're by far my best bloomers. I LOVE this plant! I just wish it was hardy here. It has bloomed profusely all summer into fall. I've deadheaded it a couple of times, but found that it really isn't necessary. It has gone through color changes with the weather. 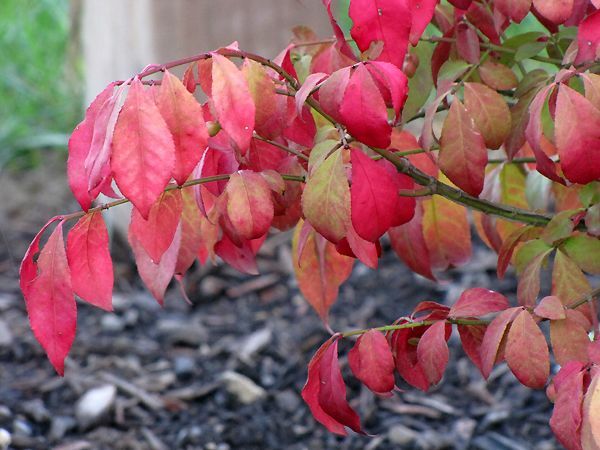 Cooler temperatures bring deeper color. I may try cutting it back and trying to overwinter it in the basement or the garage. This has been a strong grower ever since I planted it earlier this spring. It's bloomed all summer as well. I love the color and the little spurred blooms. I love the fall anemones and this one in particular. Want more! This was new here last year and it came back strong and is loaded with buds and blooms. This is another annual that I'll seek out for planting next year. It just blooms and blooms and blooms. I did learn though, that it isn't really beneficial to use a general plant fertilizer on this one. 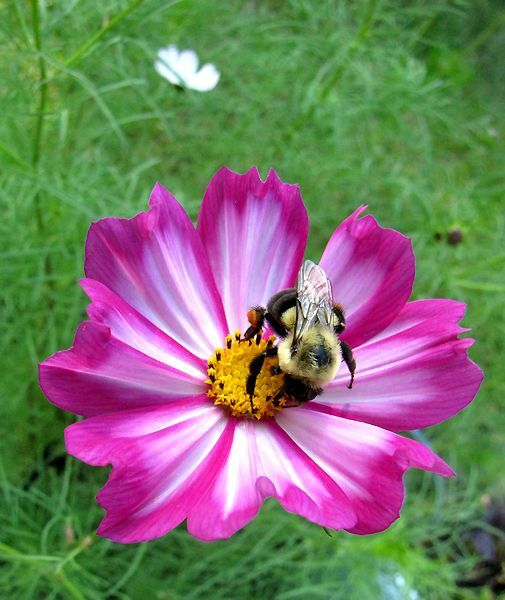 Like Cosmos, if the soil is too rich, you get fabulously lush foliage but no blooms. Once the fertilizer had worked its way out of the soil, we got lots of blooms again. It's just gorgeous right now. I got this for $12.50 about six weeks ago and it's looked just like this every day since. I hope to be able to overwinter it. This is such an unpredictable bloomer for me that I don't pay much attention to it. It didn't bloom at all last summer, but I noticed some blooms a couple of weeks ago. It's my favorite of any bougainvillea I've ever met. I love the white/pink shaded bracts. It's persnicketiness is worth putting up with for the times when it does decide to bloom. 40-48” x 24” wide, (cutting propagated). 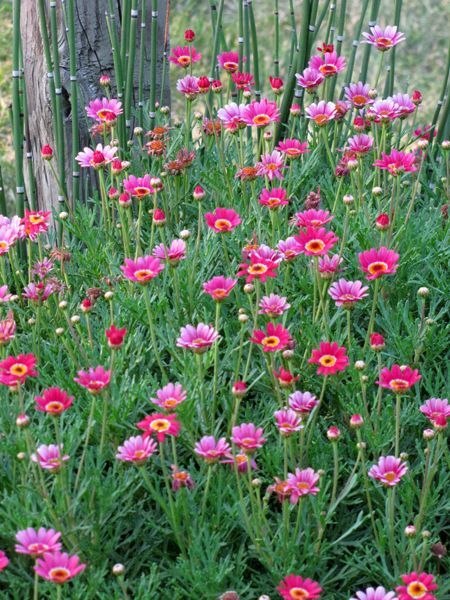 Imagine a clear sky with a line of low clouds on the horizon, tinted shades of orange, pink and lavender by the rising sun and you have the color of ‘Desert Sunrise’® flowers. 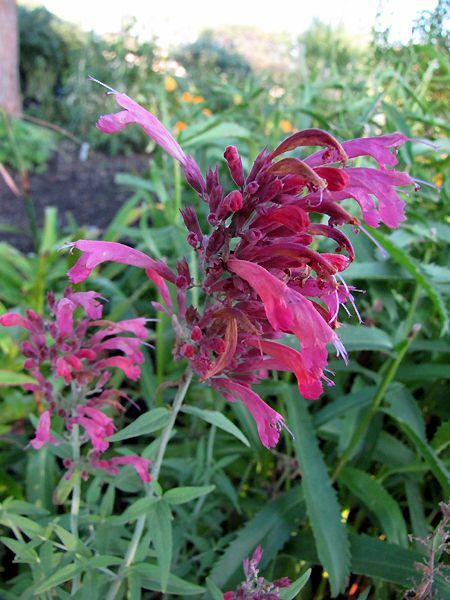 A hybrid I discovered in my garden a few years back, ‘Desert Sunrise’® is a cross between the two best southwestern species of the genus: Agastache rupestris and Agastache cana. 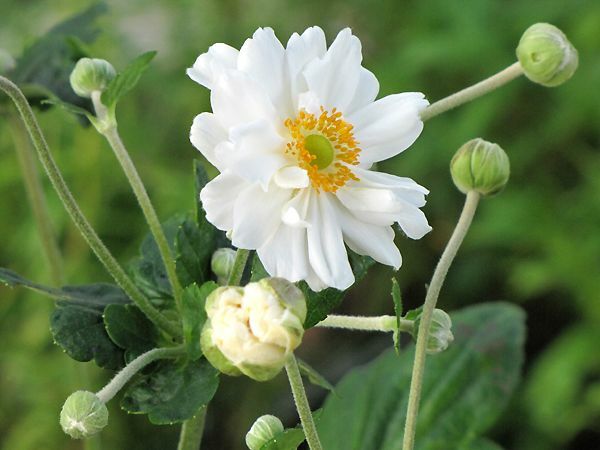 This new perennial introduction is a sturdy, vigorous grower that blooms non-stop from midsummer through fall. 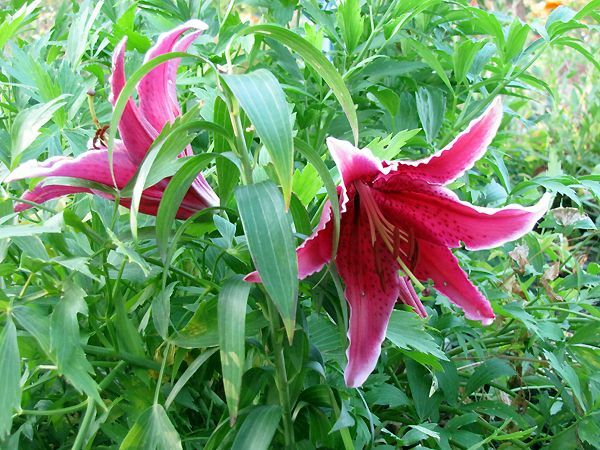 The flower spikes are quite large and both the foliage and flowers are delightfully fragrant. 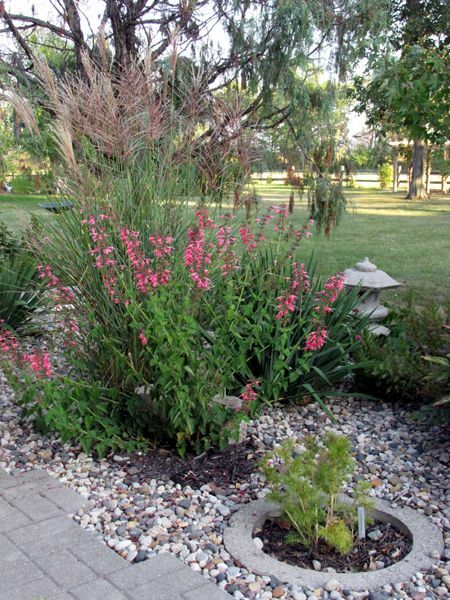 Agastache ‘Desert Sunrise’® is xeric like Agastache rupestris, but like Agastache cana adapts well to regular garden conditions with better soils and more plentiful water. 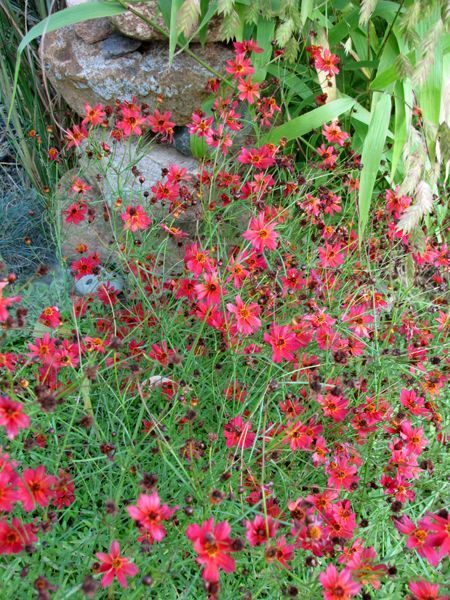 Best of all, ‘Desert Sunrise’® is a rich nectar source that is very popular with hummingbirds! This has thrown up its drumstick blooms all summer, one at a time, sometimes two. 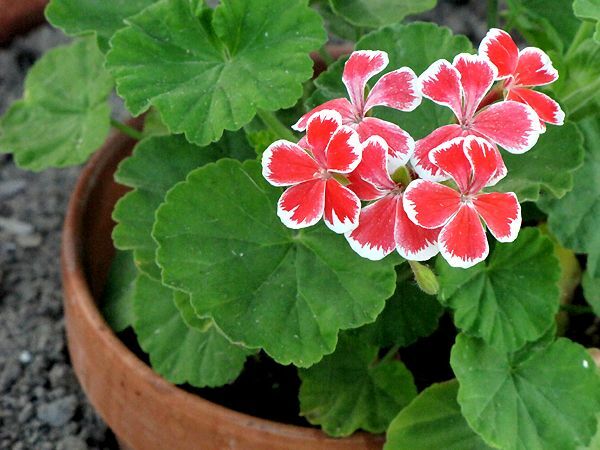 Its leaves have a whitish coating (called farina) that washes off when you water the plant, but it returns. No, not powdery mildew. 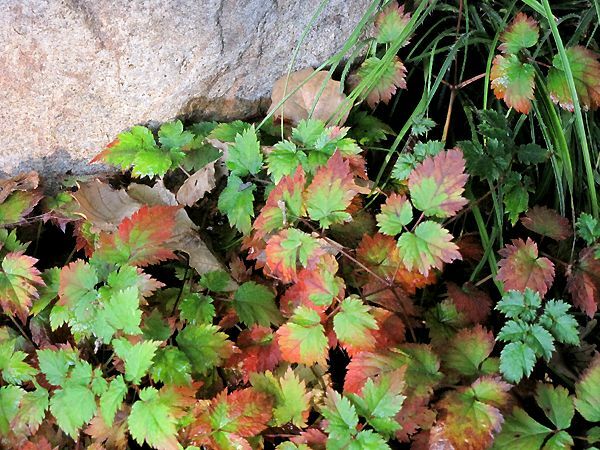 It's just a characteristic of its foliage. Yep, it's a late bloomer. Not the cultivar, just this particular plant in my garden. Garden Bloggers Bloom Day is hosted by Carol of May Dreams Garden. 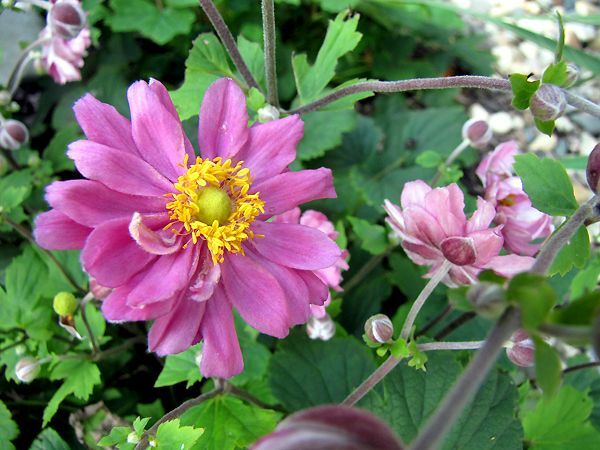 Please visit her site to see other participating garden bloggers from around the worldgar.